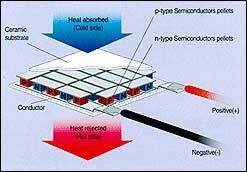 Solid state cooling systems are solid state heat pumps that operate utilizing the Peltier effect. When a cooling solution is required, the choices are conventional refrigeration techniques and solid state cooling (also known as thermoelectric cooling. )Conventional refrigeration uses a compressor, condenser, evaporator, and refrigerants to accomplish the task of cooling. These systems have mechanical components, and can be noisy and cause vibration. Anyone who has heard their own refrigerator or air conditioning unit knows the associated circumstances. The main advantage is that conventional refrigeration can be use for large-scale cooling applications. Solid state cooling systems use a thermoelectric device, consisting of a semiconductor based bi-metal junction, a heat sink, and DC power. A typical solid state cooling system is a semiconductor–based component, soldered between two ceramic plates, with a sandwich-type structure filled with bismuth telluride particles and doped to obtain N-P junctions. 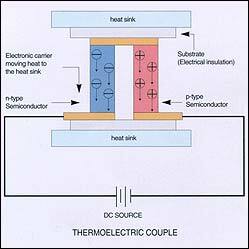 When current is passed through the junction of the two different conductors, a temperature change is achieved. There are no moving parts and no refrigerants. A solid state cooling systems is very good for smaller, quiet applications. Solid state cooling systems have no moving parts. For that reason, they offer high reliability and low maintenance over other types of cooling or heating devices. Solid state cooling systems offer low noise performance and are ideal for use in medical offices, laboratories and all other places where noise reduction is a factor. Solid state cooling systems are ecologically clean – no CFC, HCFC or even HFC types of refrigerants are involved in the process. In addition, a solid state cooling system is ideal for temperature control, allowing the system to maintain temperature accuracy of +/- 0.1 degrees Celsius. Another advantage of using a solid state cooling system is the easy to switch from cooling to heating by just reversing polarity of flowing DC current. In many applications this is extremely useful. CustomChill specializes in custom applications of solid state cooling system technology. CustomChill can work with you to help design your product to optimize the use of a solid state cooling system in your device. Contact CustomChill for further assistance with all solid state cooling systems needs.